Home » News » Register Trademarks, Two Smartphones 4 ZTE Cameras Attend in May? 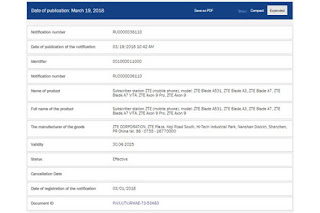 Register Trademarks, Two Smartphones 4 ZTE Cameras Attend in May? ZTE has been successful in the past year by launching ZTE Axon 7 which is one of the most successful manufacturers of the device to date. Although the sales figures are still not able to match the results achieved by the iPhone and Samsung Galaxy, but the Chinese smartphone manufacturers get a pretty good publication as a top mobile phone maker. At the end of 2017, ZTE reportedly preparing the successor smartphone from Axon 7 which reportedly will be present in two variants respectively named Axon 9 and Axon 9 Pro. The information was initially detected from the leaks of six recent smartphone trademarks filed by ZTE to Eurasian Economic Union (EAEU). Appeared in the leaked trademark document, Axon's long-awaited successor, will present not just one, but two variants. In the same list listed 4 other smartphones are classified mid-entry level. The two latest generation ZTE devices proposed bear the name of Axon 9 and ZTE Axon 9 Pro. With the submission of the trademark to Russia, both devices are likely to be launched also to Europe, Canada and the United States. Both devices will run Qualcomm Snapdragon 845 processor coupled with 6GB or 8GB of RAM. As for internal memory, ZTE offers several variants namely 64GB to 256GB. In addition, this smartphone will be armed by dual cameras on the back and front. This means there will be a total of four cameras in the same device. Comes with the Android operating system v8.1 Oreo, the two devices will also support Project Treble. The latest smartphone from the vendor is said to be carrying an interface that would be more similar to Android Stock rather than their own interface blend. In addition to registering trademarks Axon 9 and Axon 9 Pro, the document also lists other devices that appear to be suitable for both the middle and entry-level segment categories. 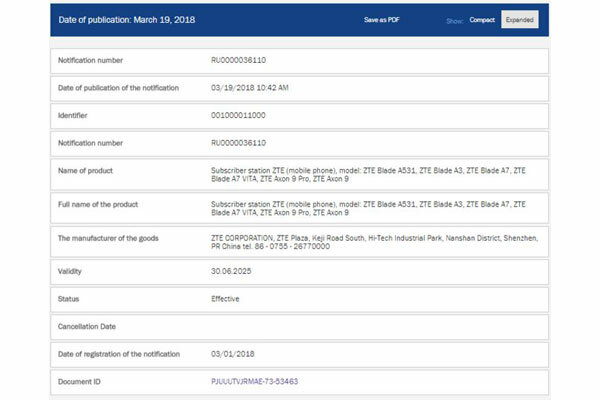 In particular, ZTE also registered trademarks of ZTE Blade A531, Blade A7, and A7 Vita. Associated with the launch of Axon 9 and Axon 9 Pro, so far ZTE has not announced its launch schedule. However, if given the release date of Axon 7 which fell in May 2017, it is not excessive if the growing speculation that the two devices will be announced in May this year. 0 Response to "Register Trademarks, Two Smartphones 4 ZTE Cameras Attend in May?"